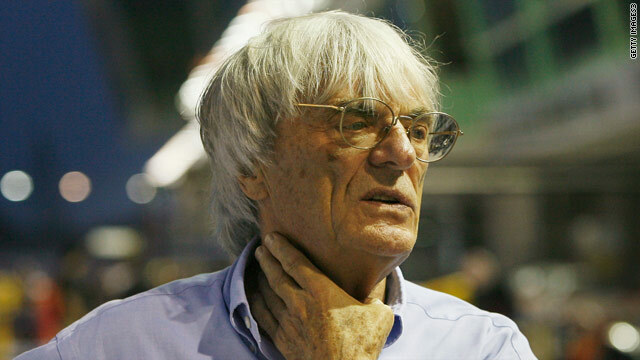 Formula One boss Bernie Ecclestone wants a New York Grand Prix by 2012. Ecclestone says a New York Grand Prix would be a "wonder"
(CNN) -- Formula One cars could be charging past iconic New York landmarks by 2012 if Bernie Ecclestone gets his way. The sport's supremo has confirmed the "Big Apple" is on his radar as he attempts to secure an F1 return to the United States for the first time since 2007. In an interview with Italian newspaper La Gazzetta dello Sport, he said: "I'm trying for 2012, opposite Manhattan in New Jersey with skyscrapers in the background. "Fifteen minutes from the centre of New York to the circuit. [It would be] a wonder." Indianapolis was the last venue in the United States to host a grand prix back in 2007 when British driver Lewis Hamilton triumphed. It brought to an end a run of eight successive races at the track. Ecclestone confirmed he was looking at the possibility of adding a race in the U.S. after the opening grand prix of the season in Bahrain. Speaking of Indianapolis he told Reuters.com: "It's only the fact that it's all the wrong crowd and the wrong people. Nothing worked there really, we'd have to have a big change round but we'd like to get back there." A total of nine U.S. circuits have hosted a grand prix.